Pennsylvania Law requires real estate brokers and salespersons (licensees) to advise consumers who are seeking to sell or purchase residential or commercial real estate or tenants who are seeking to lease residential or commercial real estate where the licensee is working on behalf of the tenant of the business relationships permitted by the Real Estate Licensing and Registration Act. 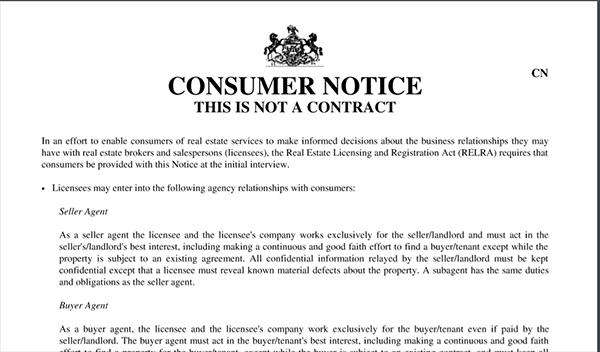 This “Consumer Notice” must be provided to the consumer at the first contact where a substantive discussion about real estate occurs unless an oral disclosure has been previously provided. If the oral disclosure was provided, this notice must be provided at the first meeting or the first time a property is shown to the consumer by the broker or salesperson.